Citing this page: Martin J. et al. Immunogenetics 70, 223-236 (2018) PMID: 28924718. IMGT/LIGM-DB: IMGT000001 (1424797 bp), dog (Canis lupus familiaris) IGH locus on the chromosome 8. The orientation of the dog (Canis lupus familiaris) IGH locus on the chromosome 8 is reverse (REV). IGH gene names are according to the IMGT nomenclature . 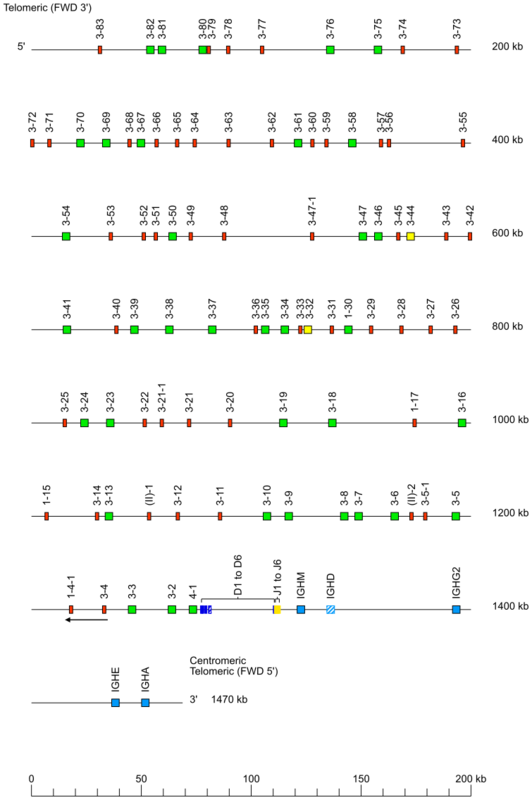 Single arrows show genes whose polarity is opposite to that of the D-J-C-CLUSTER comprising IGHD (D1 to D6)-IGHJ (J1 to J6)-IGHC (IGHM-IGHD-IGHE-IGHA).